What makes this look vintage? It was our goal to create a contemporary look with some vintage pieces thrown in. Rather than creating a look that may remind of a 1940’s Mary Poppins play, we wanted a vintage inspired look that is relevant with current menswear trends. 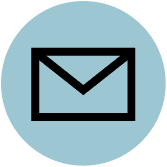 The newsboy cap for instance is oftentimes associated with the 192’0s and 1930’s; suspenders with the 1950’s and 60s’; and wingtips with the 1930’s and 40’s. Although these pieces are vintage, it is the composition of this look that makes it a dapper ensemble suited for the modern man. Bow ties and suspenders have seen a huge comeback; so has the gingham check on the shirt. Lastly, the boutonniere picked to compliment the bow tie adds some formal flair – perfect for the wedding day. 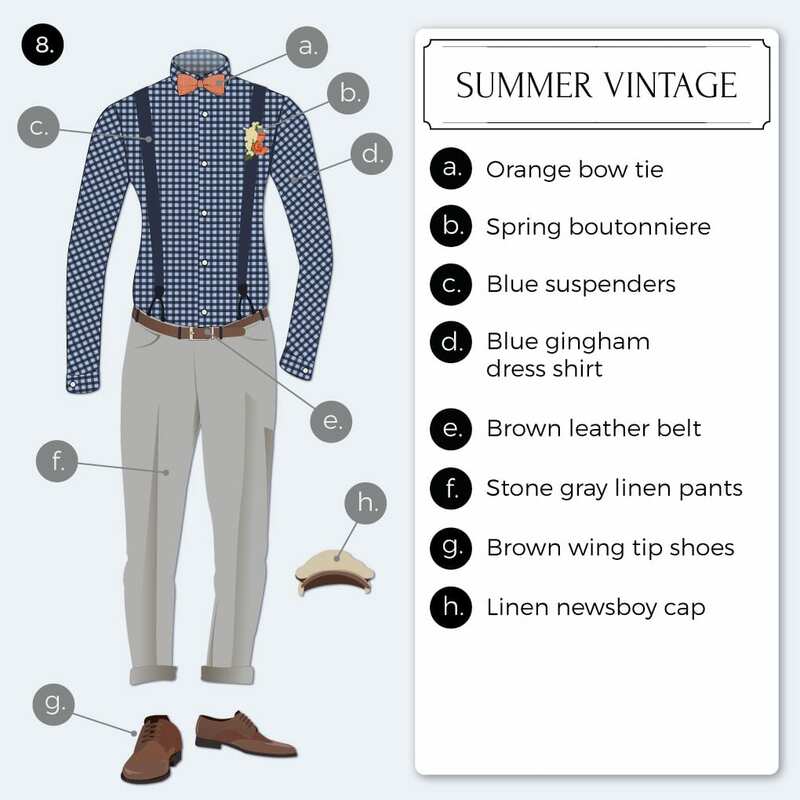 Taking your vintage summer look, how can the groom set himself apart from the groomsmen? That is a great question. The groom certainly needs to stand out a little. He needs to look better than all the groomsmen. Taking this particular look, there are a few things a groom can do. First he can dress the groomsmen down a little but removing the boutonniere. Also, he can choose to wear a linen vest complimenting his pants in place of the suspenders. 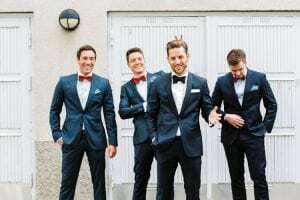 Oftentimes the groomsmen’s look needs to coordinate with the bridesmaids. How can this be achieved using the look above? When talking about coordinating, we typically think of color. Thus the best accessories to do this with are the bow ties. Bow ties in yellow, orange, light blue, pink, and purple will all go well with this look. You called this outfit a “vintage summer” look. What makes a look better suited for summer vs. fall/winter? For the most part there are two factors that differentiate an outfit from Summer to Winter. First is the fabric. The pants and the cap are made from linen which is a classic spring and summer fabric. Winter on the other hand sees thicker wools and flannels. Second is the color. Spring and Summer colors are light and lively designed to coordinate with the season. The giveaway pieces here are the beige linen pants as well as the orange bow tie and boutonniere. Lastly, you got married yourself not too long ago. 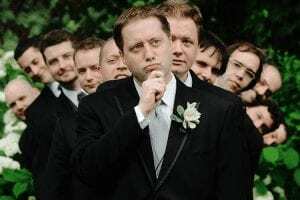 What outfit did you choose for yourself and your groomsmen? 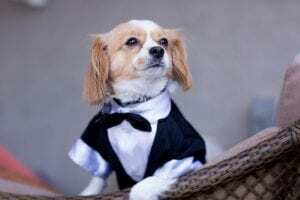 While I love to mix different patterns, colors, and fabrics on my own looks, when it came to my wedding day, my wife and I wanted something classic, formal, and timeless. Thus we choose a “Black Tie” outfit of a classic tux and solid black bow tie. I wore a 3-piece tux with a double breasted jacket and large butterfly bow tie, while my groomsmen wore a classic single breasted tux sans vest or cumberbund. Hendrik Pohl is founder of Bows-N-Ties.com and a menswear contributor to The Plunge. Keep checking back for more from his big day, menswear info series.